Ron McDole joins us on The Game Before the Money Podcast. The all-time interception leader for defensive linemen remembers winning the AFL Championship with the Bills, and facing the Chargers Ron Mix in the 1964 and 1965 AFL Championship Games. He also talks about George Allen and the Over the Hill Gang, of which he was a part. Hear the inside story about the most famous play in Super Bowl 7, when Mike Bass returned a blocked kick and subsequent Garo Yepremian interception for a touchdown. He talks about the Washington/Dallas rivalry and a time when pro football teams held training camps at a hotel. Ron played college ball at the University of Nebraska, with Pat Fischer and Mick Tingelhoff. Ron has a new book available on Amazon.com. 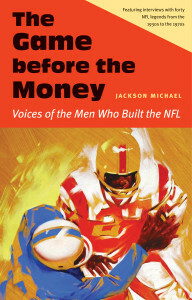 You can also order The Game Before the Money: Voices of the Men Who Built the NFL on Amazon.com and Barnes and Noble. You can listen in the player at the top, and also listen and subscribe on Apple Podcasts and iTunes, Google Play, iHeartRadio, Spotify, and Stitcher.